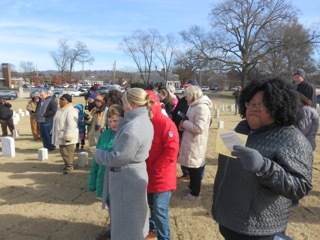 A couple dozen people braved freezing temperatures at the National Cemetery Monday afternoon to remember some people who were pushing for civil rights – at least indirectly – nearly a century before Dr. Martin Luther King Jr. They were the 42nd and 44th regiments of the U.S. Colored Troops, both of which had been organized in Chattanooga and served here with the Union Army during the Civil War. 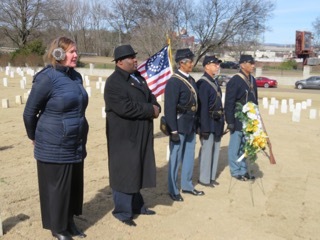 As one of the MLK Day programs in Chattanooga, a brief wreath-laying ceremony was held in the area where many of the troops – most unknown – are buried about 100 yards southwest of the cemetery office. Although not mentioned like some of the Medal of Honor recipients, Andrews Raiders, or all the World War II veterans buried there, the U.S. 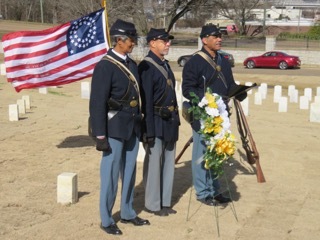 Colored Troops from the Civil War actually played a big role in the cemetery’s history, officials said. Eric Atkins of the Unity Group, one of the ceremony organizers, said they helped build the cemetery. Through that and their other efforts, they should be remembered, he said, adding that he and others are hoping to do something about that. “We hope we can build a lasting memorial so that all who come through here will know the price these men paid,” he told the group of attendees. Donald Tatum of the 44th re-enactment group said after that ceremony that the 44th saw plenty of fighting around Chattanooga, Georgia and Middle Tennessee. 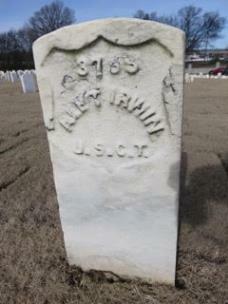 The 42nd, he said, was involved in construction projects like building bridges and helping build the cemetery. 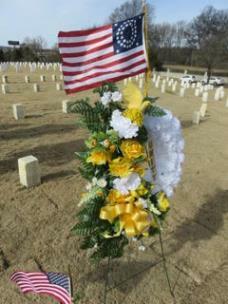 He added that it was important to honor both regiments. “It’s always a good thing to honor soldiers for their life and service,” he said. John L. Edwards III of the Mary Walker Historical and Educational Foundation was unable to attend the program, as were representatives of the National Park Service, the latter due to the government shutdown. But National Park Partners executive director Tricia K. Mims said her non-profit group has worked with the NPS the last couple of years to present some ranger-led programs about the black experience before, during and after the Civil War. “There’s an incredibly rich history,” she said. She also reminded the group that the National Cemetery is public land, as are all the National Park properties around Chattanooga. “We encourage you to feel like the National Park belongs to everyone,” she said. Near the end of the program, those in attendance were invited to sing the “Battle Hymn of the Republic,” which was a favorite song of Union soldiers during the war. To hear the program attendees’ sing “Battle Hymn of the Republic, Click here. To hear Donald Tatum of the 44th U.S. Colored Troops Re-enactment Group discuss the history of the troops and how his group keeps their memory alive, Click here.